The fourth concerto opens with an extensive section which not only introduces the basic material for the movement but also reveals the instrumental argument: a solo group is contrasted with the rest of the orchestra and within this solo group there is a dialogue between the two recorders and the violin. This functions as a microcosm of the work as a whole, containing its own contrasts, departures and returns; only at the end of the movement do we hear it again complete. 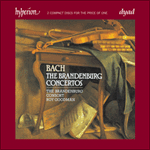 Rather than simply confining the solos to the episodes, Bach dislocates the solo argument from the ritornello structure: we simply cannot predict when the soloists will be strongly profiled, they are continually weaving in and out of the larger orchestral texture. 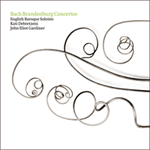 The second movement introduces a new concept in Bach’s concertos: here there is a close dialogue between the solo group and the tutti in which the contrast is highlighted by dynamics rather than melodic material. The piece thus plays on the concepts of repetition, together with light and shade. With the final movement we hear yet another interpretation of the concerto style: the opening ritornello is essentially a fugue, the subject of which can subsequently be used in a variety of ways. Indeed there are only a few places where it is entirely absent. Thus the expected contrast of ritornello and episode is replaced by frequent contrasts of instrumentation, the fuller expositions of the subject providing the tutti sonority usually associated with the ritornello. Furthermore another traditional feature of the concerto – virtuosity – is provided by the violin part, something which by its very nature turns a fugue – brilliant enough on its own terms – into a dazzling concerto movement.